Courtesy of UNIVERSITY OF HAWAII This is an aerial photograph of the University of Hawaii 2.2-meter telescope atop Mauna Kea. Following a year of a setbacks, from protests to lawsuits, the astronomy community in Hawaii might have something to look forward to in 2016 as the oldest observatory on Mauna Kea gets a major makeover. Guenther Hasinger, director of the University of Hawaii’s Institute for Astronomy, said UH plans to begin a $6 million renovation of its 2.2-meter telescope that will allow the nearly 46-year-old facility to operate largely on its own. He said the result will be a “modern robotic telescope” able to open and close its dome automatically, depending on weather conditions, and make pre-programmed scans of the night sky, hopefully by the end of 2016. With the help of adaptive optics, which adjusts for the distortion in the atmosphere, Hasinger said it could rival the Hubble Space Telescope, which has a slightly larger 2.4-meter aperture. “It’s a huge improvement,” he said. The funding includes $2.5 million from the state Legislature and $500,000 in private contributions, Hasinger said. The money from the Legislature also included $450,000 for UH-Hilo to replace its broken Hoku Kea teaching telescope. That telescope was one of three identified for early decommissioning as a result of Gov. David Ige’s request for a quarter of the telescopes on the summit to be removed by the time the controversial Thirty Meter Telescope is built. The new Hoku Kea teaching telescope and dome will be placed initially at the UH-Hilo campus, possibly also in 2016. While it now can’t be placed on Mauna Kea, Hasinger said a more permanent location with clearer skies than Hilo is still being pursued. 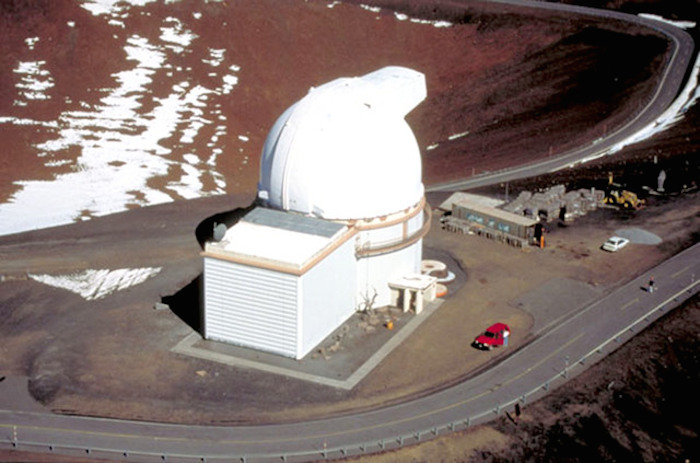 In addition to Hoku Kea, the Caltech Submillimeter Observatory, which stopped operations last year, and the UKIRT telescope also are planned to be removed. Ige has said reducing the existing footprint on the mountain is part of his pledge to improve management of the summit, considered sacred ground by some Native Hawaiians. “They (the university) promised to take out obsolete telescopes, so they should do it, and we’re going to make sure that they do,” the Honolulu Star-Advertiser quoted the governor as saying earlier this month. Hasinger, while thanking Ige for his supportive comments regarding TMT, said he disagrees with his characterization of the telescopes as being obsolete. The only one that might fit that description is CSO, which already was planned to be removed, he said. Hasinger referred to the UKIRT, formerly known as the United Kingdom Infrared Telescope, as the second most scientifically productive telescope in the world, behind the Keck telescopes. “That one is hurting us the most,” Hasinger said, regarding its removal. UH officials said they selected UKIRT for early decommissioning because it owns the telescope and the site was not expected to be reused after the university’s master lease expires in 2033. Hasinger estimates UKIRT could operate for another seven to eight years prior to TMT’s completion, assuming the $1.4 billion observatory is able to regain its land use permit, which the state Supreme Court overturned nearly a month ago, and survive any other legal challenges. The high court found the state Board of Land and Natural Resources erred by approving the permit before a contested case hearing was held. The matter was remanded back to the 3rd Circuit Court, which will send it back to the board to restart that process, assuming the TMT International Observatory decides to move forward. The nonprofit organization planned to finish grading the site and paving an access road from March through September, but that work was halted by protesters who blocked the Mauna Kea Access Road three times. TMT estimated in court documents that it was losing $220,000 a month while its equipment sat idle on the mountain. If TMT isn’t built, Hasinger said he hopes to be able to keep UKIRT operating until the end of the master lease. The Canada-France-Hawaii Telescope also is planning a major upgrade, though telescope Director Doug Simons said its fate will be more tied to what happens with TMT and whether or not the master lease is renewed. The Maunakea Spectroscopic Explorer project, estimated at $300 million, would turn the 3.6-meter CFHT into a 10-meter telescope that will specialize in observing as many as 3,400 objects simultaneously, he said. Simons said the telescope would keep its existing footprint and would serve as a “feeder” to bigger telescopes such as the TMT that would look at the objects in more detail. But concerns in the international astronomy community about local opposition to building on the mountain could make fundraising a much more difficult task, he said. He said those concerns could be resolved with the renewal of the master lease. But Simons said any such extension needs to balance Hawaiian culture, science and the environment. The TMT International Observatory might have racked up a tab of nearly $2 million as its construction equipment sat idle on Mauna Kea for much of the year. Scott Ishikawa, a spokesman for the Thirty Meter Telescope, confirmed the nonprofit organization spent about $220,000 a month while work was delayed as protesters blocked workers from reaching the construction site. That figure was cited in court documents filed in November prior to the state Supreme Court overturning the $1.4 billion project’s land use permit. The high court found the state Board of Land and Natural Resources erred by approving the permit prior to having a contested case hearing. The equipment sat idle from March 24 until it was removed Dec. 16. TMT spent another $107.5 million in 2015 on other work related to the project, including manufacturing underway in its five partner countries, according to court records. Ishikawa said no decision has been made regarding whether TMT would again pursue the permit.